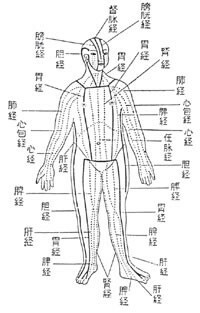 Koho Shiatsu is similar to acupuncture, the difference lies in its application to self-defense. 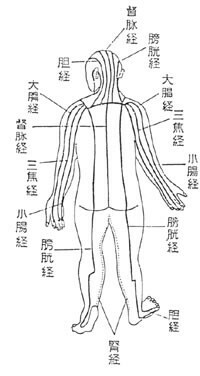 The application of Shiatsu from the Hakkoryu prospective lies in the two areas. One is the medical area where practice and application is used to address physical aliments and help the body regain its natural consistency of operation. The other is the Goshin Do application, which addresses self-defense. Combining the two gives an individual a thorough understanding of the effects of application against various situations. The first method of examination in Hakkoryu Koho Shiatsu is called Myakushin (palpation or pulse diagnosis). Myakushin takes about ten minutes and is used to diagnose exactly what is wrong with a patient and which Keiraku (meridian) should be treated. Then without touching the affected, injured, or painful part of the body, Nidai Soke applies Koho Shiatsu treatment to the appropriate Keiraku, which will be one of the regular fourteen Keiraku in traditional oriental medicine. Myakushin, in Hakkoryu Koho Shiatsu, relies on the traditional Keiraku and are used to diagnose each of the twelve major Keirakus’ strengths and weaknesses. To determine which of the Keiraku, such as the lungs, the heart, etc. are related to the patient’s chief complaint is the goal of Myakushin. This therapy diagnoses general pulse beats, but does not merely count the pulse beats. Rather, it diagnoses the harmony or disharmony between the breath and pulse and observes blood pressure. Furthermore, both wrists are used to diagnose the three positions of pulse to determine their relational equilibrium, disharmony, and/or abnormality. The three conditions of Myakushin determine how a Keiraku will react to appropriate treatment. It is often surprising what such diagnosis reveals, which went undetected using Western medical techniques. Koho Shiatsu is applied using the head of the thumb, avoiding pressing with the nail. This is the general method, but for patients who experience difficulty in turning or changing their body position, use the index and middle finger to get at hard to reach Keiraku. The center of the thumb should be applied to the appropriate Tsubo (pressure point) on the relevant Keiraku, and pressure should be applied at an angle to give a sensation of pain. Koho Shiatsu’s method of using the thumb is to lightly touch the skin first, second to press, and third to release very quickly. This is the way to apply the best stimulation. There are other Koho Shiatsu techniques used to stimulate specific body parts and help address particular diseases. Pressing a Tsubo for two or three seconds is one of them. The principle method of Koho Shiatsu is to apply pressure to the Tsubo of the appropriate Keiraku while avoiding the damaged, diseased, or painful area. Thus, Koho Shiatsu’s principle methods not only treat various diseases, but they also prevent many kinds of illnesses from actually occurring in the first place. Also, Koho Shiatsu energizes the patient by stimulating and thereby encouraging the circulation of one’s Ki (vital energy), which reinforces all the Keiraku internally and externally related to one’s organs that keep a person both mentally and physically in good health. Hakkoryu Koho Shiatsu uses more than just the particularly reacting Keiraku to treat diseases. It considers the principle of universal gravitation for the treatment from the upper body to the lower body, or the origin of the Keiraku’s Ki flow (Tanden or Hara) to the end. When applying pressure to Koho Shiatsu points, the direction of pressure and treatment may be reversed if there is a strong or unusual reaction in the patient. Manifestation of pain, discomfort, or some kind of disharmony may occur when applying treatment to particularly out-of-balance Keiraku. During treatment, almost no power is used to press the Tsubo. Rapidly applying pressure with rhythmic momentum can effectively heal or cure many kinds of serious, painful, and acute illnesses. Thus, Hakkoryu Koho Shiatsu has many unique features. There are a lot of successful reports and appreciation letters sent to Hombu Dojo from patients who, because of Koho Shiatsu, have recovered from their health problems and diseases. Hypertension, Neuroses, Palsy, Lumbago & Low Back Pain, Gastroptosis & Gastritis, Gastroenteritis, Gastric Ulcer, Tuberculosis, Painful Joints, Gallstones, Shingles, Tonsillitis, Kidney Stones, Appendicitis, Presbyopia, Asthma, Infantile Paralysis, Common Cold & Flu, Rheumatism, Fever, Hemorrhoids, Sciatica, Uterine Fibroid, Irregular Menses, Arthritis, Nephritis, Constipation & Diarrhea, Impotence, Bronchitis, Insomnia, Allergy, Bed Wetting, Vertigo, Hernia, Whiplash Injury, Tinnitus, Headache including Migraine, Anxiety, Abdominal Pain, Rhinitis, Stroke, Sprains, Diabetes, Hypotension, Eczema, Frozen Shoulder, Tennis Elbow, Etc. HAKKORYU UNITES MARTIAL ARTS AND MEDICINE SO AS TO SHOW CLEARLY THAT THEY ARE BUT ONE AND THE SAME.